About 5 months ago two teenagers from a small town named Cisco Texas parted ways, one for Southern Nazarene University and the other for West Texas A&M. The base cost of tuition is about $10,000 more at SNU; the student to faculty ratio differs from 15:1 to 19:1 respectively. How have these changes in culture and scenery affected the daily lives of these students? Not as much as you might think. Noah McKinney and Kassidy Payne are our subjects of interest. The former is a mass communications major at SNU and the latter a Theater major at A&M. 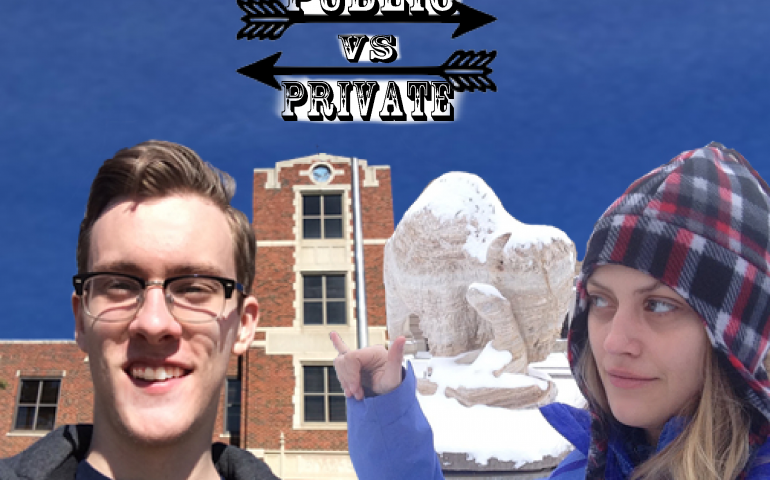 Payne’s days consist of creating art, practicing her part for the school play and sewing a minimum of three hours in the costume shop, whereas McKinney spends most of his time writing papers, filming and playing intramural volleyball. SNU being a Nazarene school gives McKinney many opportunities to come closer to God. From chapel to Kingdom Come, McKinney believes “it is great to be around people who believe like I do”. Living on a Christian campus, there isn’t much adversity foreseeable for McKinney. However, since Christian complacency can breed ignorance, many of the mandatory religion classes are designed to test one’s faith. Payne has no such classes and has to find other ways to grow in spiritual knowledge. When trouble may arise, be it spiritual or worldly, both Payne and McKinney can find a confidant among their educators. There are many opportunities on both campuses to make new friends; whether it is through A&M’s RA events or SNU’s SGA events. “There is always something to look forward to” says McKinney. Whether you go to a private or public school, there is no getting around the fact that college can be overwhelming. Both students’ worries are lightened by a concept employed at both universities: advisors! Whenever either of them has a question about scheduling, their advisors are but an email away. In the end, no amount of comparison will make either school come out on top; both have their strengths and weaknesses. The deciding factor in public school vs. private school lies in the specific personality of the individual. Prev PostWho will you vote as THE MAN?